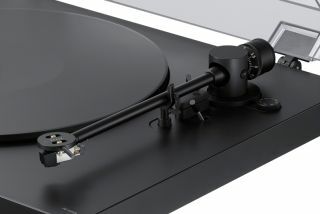 Sony PS-HX500 turntable converts vinyl to hi-res audio | What Hi-Fi? The new Sony "audiophile turntable" promises the best possible vinyl sound, but also comes with a vinyl ripper for converting records to hi-res audio. Hot on the heels of the new Technics SL-1200 turntable, comes a new turntable from Sony, the PS-HX500, that promises to get the best from your vinyl - and help you take your records with you on the move. No, it's not a portable record player, instead it comes with a "high quality DSD native converter" that allows you to rip your vinyl to digital files in up to hi-res audio quality. The PS-HX500 claims to be the world's first to do this and also to support double-rate and single-rate DSD files. You can also copy your vinyl records as WAV files. It comes with PC software to enable the process, with Sony naturally suggesting "the recording process is quite simple". The deck itself has a die-cast aluminium platter, is belt-driven - unlike the Technics direct-drive deck - and is powered by a two-speed motor. Belt-driven decks tend to be favoured for audio quality. There's a high density 30mm plinth, plus a new tonearm, rubber mat and insulating feet. It comes supplied with a moving magnet (MM) cartridge. The Sony PS-HX500 is due out in April with a price tag of around £400.